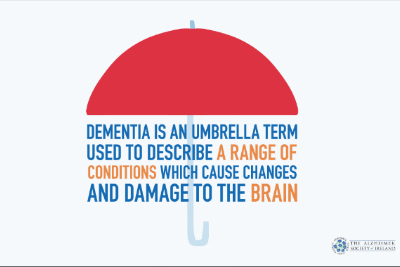 Dementia is the name for a range of conditions that cause damage to the brain. This damage can affect memory, thinking, language and the ability to carry out everyday tasks. There are many conditions which cause dementia. Alzheimer’s is the most common cause. Vascular dementia, dementia with Lewy bodies and Frontotemporal dementia are other causes. Sometimes a person may experience a mix of two types of dementia and this is called mixed dementia. Some people may be diagnosed with dementia and it may not be possible to confirm if it is Alzheimer’s or another cause of dementia. There are many diseases that may cause dementia. The most common causes include Alzheimer’s disease, vascular dementia, dementia with Lewy bodies and Frontotemporal dementia. 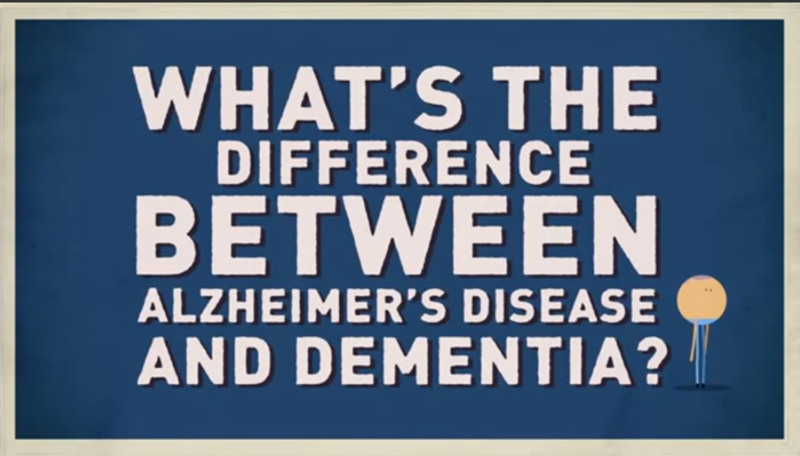 Alzheimer’s disease is the most common and well-known cause of dementia. It is thought to cause over half of all cases. It is recognised by the build-up of protein in the brain which forms plaques and tangles that stop the brain working as it should. Difficulty in finding the way, even in familiar places. It is important to remember that symptoms vary from person to person as everyone’s experience with the disease is unique. One of the first things I noticed, apart from her memory, was her ability to coordinate daily tasks was deteriorating. When she cooked a meal, she might cook the vegetables first and it could be hours afterwards that she would put the meat on. Vascular dementia is the second most common type of dementia and it occurs when the blood supply to the brain is damaged. There are two main types of vascular dementia; one caused by stroke (Multi-infarct dementia) and the other by small vessel disease (Subcortical dementia). Multi-infarct dementia is a type of vascular dementia that is caused by small strokes. The strokes can be so tiny that no-one notices them happening, but the person may get worse quite suddenly and then not change again until the next stroke happens. As a result, the progression of this dementia is often described as happening in steps rather than steady gradual changes, such as in Alzheimer’s disease. Subcortical dementia is another type of vascular dementia and is caused by very small blood vessels that are in the inner parts of the brain. Frontotemporal dementia, including Picks Disease is a rare type of dementia which is caused by damage to different areas of the frontal and temporal lobes of the brain. During the early stages, a person’s memory may be fine but their personality, behaviour and language skills can change. The progression of this dementia is unpredictable and in the later stages symptoms are similar to those of Alzheimer’s disease. Other forms of dementia include alcohol-related dementia such as Korsakoff’s syndrome and Creutzfeld-Jacob Dementia. Some people with Down’s syndrome also develop dementia in middle age. Most people will experience a number of these signs, and they will find they are having increased difficulty over time. In general, signs and symptoms emerge gradually. This can be difficult for both the person who is experiencing changes and for their family and friends. There is no one test used to diagnose a type of dementia. Rather, the diagnosis involves a range of assessments and tests and this can mean that confirming a diagnosis can take time, particularly in the early stages. The GP will generally begin an assessment by ruling out other possible causes of symptoms you are experiencing; this may involve running some tests including blood tests and memory tests as well as an overview of your general health. Some other possible causes of the symptoms you are experiencing include thyroid disorders, vitamin deficiency and side effects of some medication. The GP may refer to a consultant who will conduct a full assessment to try to establish the cause of the symptoms. Click here to find out who’s who in dementia care, as they can work with you to help you understand the diagnosis. A diagnosis of dementia can come as a shock, no matter how much it is expected. It is hard for everyone concerned and reassurance and support are vital. The most important thing is to try to be positive and to know that you are not alone. There are people you can talk to and supports and services that can help. Each person’s experience with dementia is unique to them. Dementia may last many years, sometimes progressing faster, sometimes more slowly. This means that it is not possible for anyone to tell you exactly how the condition will progress and how long a person can live with dementia. Many people find it stressful that they do not have answers to these questions and that is normal. It is important to understand as much as you can about dementia as it can help you to come to terms with the diagnosis and what may lie ahead. It can be useful to think about the way dementia progresses in stages, however it is important to remember that this is only a guide, some symptoms may appear earlier or later or not at all. 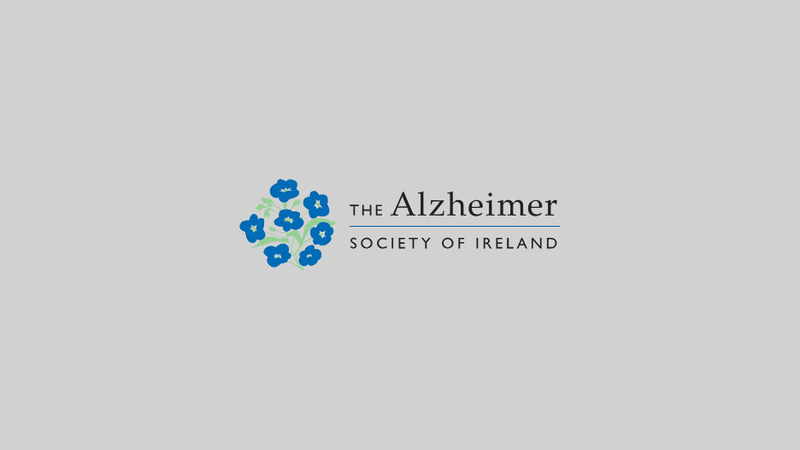 The following provides an outline of the three stages that are associated with Alzheimer’s disease. Following this, there is a note on the progression of vascular dementia, dementia with Lewy body and Frontotemporal dementia which all have specific characteristics associated with them. On average people live 8 to 10 years from the time first symptoms emerge. However, life expectancy varies considerably depending on how old a person is when symptoms begin. A person diagnosed in their 60’s will live longer than someone diagnosed in their 90’s. Life expectancy is also affected by other illnesses the person experiences. Many people in the early stages of dementia engage in activities they enjoy but at times they may find it hard and may need to rest more frequently. As dementia progresses, changes are greater and a person will need more support to help them to manage day to day living. As a person finds it harder to do things, they may lose confidence and withdraw or be upset. Others may feel frustrated and angry and be argumentative or quick to lose their temper. During the late stage of dementia, a person will need increasing amounts of support and will gradually become dependent on others for nursing care. A person will become increasingly frail and may walk unsteadily; they may need a wheelchair or be confined to bed. During this stage the ability to fight even simple infections is low. While a person with late stage dementia may have difficulty communicating, they will often respond positively to affection, a smile, and a soothing voice. Music, scent and hand massage can bring comfort and enjoyment. Vascular dementia is generally caused by a stroke or a series of small strokes. As a result this type of dementia may progress in a ‘stepped’ manner, which differs from the more gradual progression of Alzheimer’s disease. Symptoms may appear to suddenly worsen due to a stroke and then remain level for a period of time. It may be months or years until the next stroke occurs and symptoms can then worsen. Where vascular dementia is caused by a series of small strokes, then symptoms can emerge in a more gradual way. People with vascular dementia tend to maintain their personality and emotional responsiveness until the later stages of the condition. This can mean that people are more aware of their condition and can be more prone to depression than people with Alzheimer’s disease. In general people with vascular dementia live for around five years after symptoms begin. In many cases, the person’s death will be caused by a stroke or heart attack. Half or more of people with dementia with Lewy Bodies will also develop symptoms of Parkinson’s disease. These include slowness of movement, stiffness and tremor. Other symptoms include difficulty judging distances, falls and fainting. Visual hallucinations, paranoia and delusions may also emerge. In the early stages of this dementia, the abilities of the person may fluctuate drastically, even during the course of a day. This can be very confusing for all concerned. In the later stages, this dementia progresses in a similar way to Alzheimer’s disease. People usually live for six to twelve years following onset of symptoms. Each person’s experience with their dementia is unique to them, and there is no way to say exactly how their dementia will progress, which symptoms will emerge and when and how long they may live with their condition. The above is just a guide to help to understand how a dementia may progress however it is important to note that everyone’s experience with dementia is unique to them. Sadly there is no cure for dementia at present however there are treatments that can help. Drug treatments can be effective for some people and there are a range of medications that can help with some of the symptoms. People with dementia can be prescribed a range of medications during the course of the illness. Some are specifically for Alzheimer’s disease and others are for symptoms that may emerge as part of the dementia. There is a range of Alzheimer drug treatments that can help some people. They do not cure dementia but can help with some of the symptoms. For some people the drugs can help to slow down the progression of the dementia for a period of time. These treatments are not successful for everyone so it is important to discuss all options with your doctor. In general donepezil, rivastigmine and galantamine are used for people with mild to moderate Alzheimer’s disease. Memantine is usually prescribed to people in the middle to later stages of the disease. These are the chemical names for these drugs; the prescription may have a trade name also on the script. The trade names for the drugs are listed above in brackets alongside the chemical name. Ask the doctor if you are unsure. These drugs may also be used for people with Lewy body dementia and in some cases for people with vascular dementia. People with vascular dementia often need to take medications for underlying conditions such as stroke, high blood pressure, diabetes, high cholesterol or heart problems. Controlling these conditions and adopting a healthy lifestyle by not smoking, drinking only in moderation, taking regular exercise and eating a balanced diet may help to delay the progression of this dementia. Not every person with dementia will need these medications and there are other methods to help manage these symptoms. Some people may need medication for a short period of time. A decision to prescribe these medications should involve a full assessment of the person with dementia, their physical health and well-being. A Psychiatrist of Old Age may be introduced in order to carry out this assessment and help manage the symptoms. Areas such as unrecognised pain, eyesight, hearing and dental health should be explored to see if there are any other causes for the behaviour. It may be possible that the behaviour is a result of something in the environment triggering a response. Talk to the doctor about daily routines, likes and dislikes so they can build a full picture and help to identify what is triggering the behaviour. There are lots of ways to manage symptoms and behaviours that may emerge, medication is one option which may or may not be suitable. With all medication, it is important to understand what drugs are being prescribed, why they are being prescribed, what benefits they are supposed to bring, and what side-effects may emerge. Where possible, it is important for the person with dementia and a trusted person to discuss this with the prescribing doctor. If a person with dementia is unable to participate in a discussion about medication, it is important that their family or carer understand what is being prescribed and why. Talk to the doctors and ask questions. Ask them to provide information about the medications and to write out dosages and times to take them. It is also important to give doctors feedback on any changes experienced when taking the medication, both positive and negative. You can talk to your doctor or pharmacist about issues that may arise. Your pharmacist may be able to provide the medications in a blister pack or a medication box which arrange medication by day and time or log onto www.dontforget.ie Building a relationship with a pharmacist can be helpful. It may also be helpful for another family member or friend to be aware of the medication routine and the name of the doctor and pharmacist you work with. Visit your GP or pharmacist.